Two years ago, my brother Brian discovered a great-tasting, all-natural sweetener that comes from a plant in Mexico. It''s called Agave Nectar and it tastes just like honey. We''ve been using it for 8 months now as a way to to reduce the amount of refined sugar in our diet and it has made a HUGE difference in our health. "It has a glycemic index of only 27!" he said with excitement after paying $10,000 to have it tested by the FDA approved Glycemic Research Institute. "So...what does that mean?" I replied. He explained that the glycemic index measures how high your blood sugar rises when you eat certain foods. Corn Flakes, for example, have a glycemic index of 119; White bread=112, Rice=83, Honey=83, Apple=54, peas=32, and Agave=.......only 27!!! So, as far as your body is concerned, there is three times more sugar in rice than there is in Agave. That''s great news for people with Diabetes or anyone who wants to lower their blood sugar level. We all know that refined sugar is bad for us but until now there hasn''t been a tasty, natural alternative. Now there is! It''s easy to use too, just substitute 1/4 cup Agave for every 1 cup of sugar in your recipes. To make it even easier, we''ve created a new Cook''n with Agave CD. Agave Nectar is a natural caloric sweetener with the lowest glicemic index obtained from the Agave plant that can be used to sweeten any type of beverage or food. 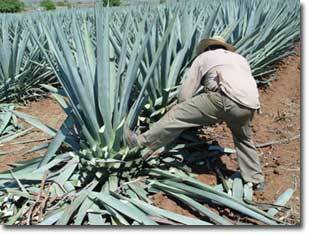 Agave Nectar comes from the Agave Plants. 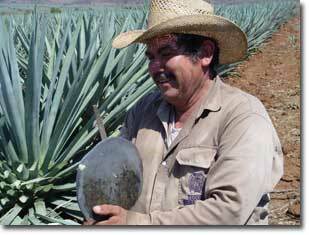 The plants are in the same family as the Blue Agave, from which tequila is made. Only recently has it come in use as a sweetener. It has a low glycemic level and is a delicious and safe alternative to table sugar. Unlike the crystalline form of fructose, which is refined primarily from corn, Agave Nectar is sweet in its natural form. This nectar does not contain processing chemicals. Even better, because it is sweeter than table sugar, less is needed in your recipes and meals. It can be most useful for people who are diabetic, have insulin resistance (Type II, non-insulin dependant) or are simply watching their carbohydrate intake. Agave Nectar is the recommended natural caloric sweetener in low calorie diets for reduction and weight control, mainly when it is added to non-acid foods and beverages. It might be used in less than quantity than sucrose or synthetic sweeteners, obtaining the same sweetness level with fewer calories. In recipes, use about 75% less of this nectar that you would use of table sugar. ¼ cup of Agave Nectar should equal 1 cup of table sugar. Due to its slow absorption by the human body, Agave Nectar works as intelligent caloric food, since it is absorbed according to the body needs. Agave Nectar is the natural caloric sweetener with the lowest glicemic index. Under medical control it can be used by diabetic people (Type II, non-insulin dependant). Due to its perfect sugars relation along with oligo-organics (characteristic of the Agave plant), Agave Nectar mixed with citric juices might be considered as a natural laxative, relieving constipation problems. The Agave Nectar oligo-organic contents help the well functioning of gall bladder, helping to saponification of fats. Its oligo-organic contents also work against the blocking of arteries and veins due to high cholesterol levels. Agave Nectar enhances flavors, keeping the perfect flavor for a longer period of time. Agave Nectar has the same sugar proportions as found in the plant itself. Our processes do not include the use of synthetic resins for the clarifying and demineralization processes hence; we do not use numerals (ciphers) to show sugars proportions. In recipes, use about 75% less of this nectar than you would use of table sugar. ¼ cup of agave nectar should equal 1 cup of table sugar. For most recipes this rule works well. Agave Nectar has met the "food exchange requirements" by the American Diabetic Association and American Dietetic Association for product labeling! The benefits that can be derived from using Agave Nectar as your sweetener are numerous: * Agave Nectar is low glycemic. It will not over stimulate the production of insulin. * Agave Nectar does not contain processing chemicals. * Agave Nectar is safe and recommended for children. * Agave Nectar can be used for baking, cooking and anywhere else where you would normally use sugar or a chemical, artificial sweetener. 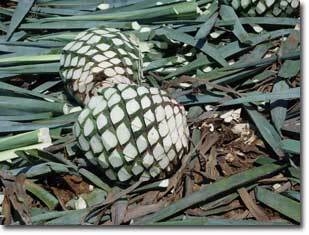 Early inhabitants of the Americas discovered the many properties of the Blue Agave plant thousands of years ago. The plant was harvested for a variety of uses, including food, drink and clothing. It was not until recently, however, that the nectar from the plant was recognized for its exceptionally sweet properties. Today, the heart of the finest Blue Agave plants is harvested processed and made available as Agave Nectar by Molino Real. Agave Nectar is a delicious golden syrup composed of 90-percent fructose sugars and 10-percent glucose sugars respectively. Because fructose is 42 percent sweeter to the human brain than granulated sugar, less is needed to achieve the same level of sweetness. The less used, the fewer the calories consumed. Fructose is also a great deal easier to digest and use by your body than standard refined sucrose products or even the so-called "natural sugars" found in health food stores. Unlike fructose sweeteners that are produced chemically, Agave Nectar contains no sulfur dioxide, hydrochloric acid or other harmful toxins. Agave Nectar is an exceptional very low glycemic index sweetener, certified organic and contains no chemicals. And yes, it is safe for kids!